When new customers visit our Hino showroom, they often look for feedback from other shoppers and business owners regarding the different trucks in our lineup. What is the Hino 195? The Hino 195 is a light-duty cabover truck that’s suited for delivery, food transport, contractor use, and more. 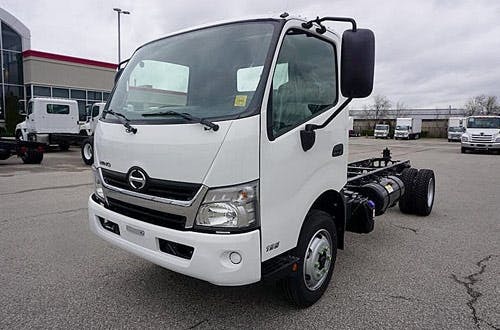 The light duty rating means that it has a GVWR (gross vehicle weight rating) of 33,000 lbs; how much the vehicle itself with cargo and the driver included can handle. To put it simply: that’s a lot for such a compact vehicle. You’ll be pleasantly surprised at just how much equipment or deliveries you can fit in a 195. Cabover trucks gained popularity because of their easy-to-maneuver and high visibility driving position. The 195 takes this concept to another level with narrow A-pillars, strategic mirror positioning, and lots of windshield and side window space. You’ll feel like you’re above the road while also being able to see everything you need to make smart driving decisions. The 195 is available with different wheelbase options of up to 180 inches. This means that you can find the custom-size box for whatever your business needs in the truck that works best. You’ll find solid, secure wheelbases with a smart design that allows for maximum strength every time you hit the road. These wheelbase options can work with body lengths of up to 22 feet and look going doing it. The body is fully customizable with almost endless colour options to choose from. Whatever your business colour, we can match it to make you look as professional as can be. The body is also designed to be aerodynamic compared to other trucks out there. This means that you’ll find improved fuel efficiency. You’ll find two convex mirrors available to you at all times, power and heated mirrors on the outer rearview, and a high-back driver’s seat with a magnetic suspension to keep you up higher and feeling better, no matter how long your drive may be. When you buy a Hino, you’re not just getting a truck. You’re getting a vehicle that was built with working hard in mind. You’ll have access to 24/7 roadside assistance, a 5-year warranty, Hino genuine parts with a 3-year parts warranty. Parts purchased outside of warranty and installed at Somerville Hino also carry a custom parts warranty to keep you trucking! Our dedicated Hino team can help you find the right Hino truck for you and your business. From the 195 and beyond, our new and used Hino inventories are packed with unique and cost-effective options for all business types.